Teach basic throwing and math skills. This colorful target makes it easy! It's a cinch to set up and store. Includes a target w/ stand, bean bags and storage bag. Everything you need for target practice fun! Target Toss Challenge, use this colorful target to teach basic throwing and math skills. Large target is easy to set up and store. Includes 6 bean bags for tossing, metal target stand, target and zippered storage bag. 40" x 40" x 17". Bigger and much better than expected! As an activity director at an independent living community I was looking for something residents could play independently. Residents enjoy having it set up in the lawn area where they can play at their leisure. Nice addition to our school fun fair. 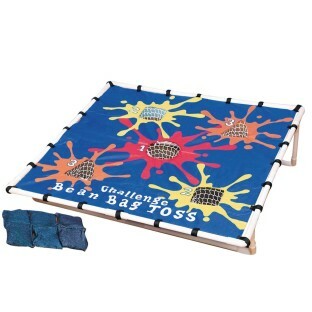 I am an Adapted PE Specialist and I use this for my classes as well as outside my classes.My students absolutely love this and have lots of fun when I am teaching my underhand throwing unit.I also use this when I go to family/friend events such as tailgates parties the beach etc.This product is so fantastic I bought 2 - very easy to set up and break down to store! We use this product for children with disabilities. Kids love it. It is visually engaging and fun. The set up is more involved than I would have hoped for and the pipes break if stepped on by little feet. This product works better for light monitored useage.